We've been serving Douglasville for over 18 years. It's our home and backyard. We're also working hard to reach more cities outside the perimeter. 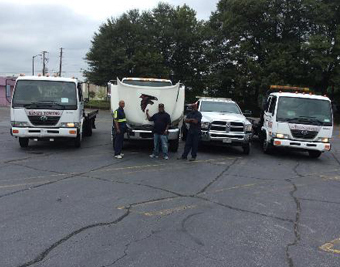 King’s Towing Atlanta has been in business for 18 years with our head quarters located at our Atlanta Facility and we service other locations like Midtown, Downtown and All Metro Atlanta. King’s Heavy duty towing Douglasville extensive experience in light, medium, and heavy duty towing services plus an outstanding safety record we pride ourselves in. King’s Heavy duty towing Douglasville also offers tire changes, auto battery jumpstart, car door unlocking, gas delivery with fast response times. King’s Towing Atlanta billing terms is payment upon completion of service and we accept all major credit cards. At King’s, we pride ourselves on our ability to provide Heavy Duty towing for all your needs. We have a large fleet of towing trucks and equipment that will get you from where you are to where you need to be. King’s Heavy duty towing Douglasville provides 24hr heavy duty towing for all truck weights and classes on the Douglasville , Ga area. Our operators are experienced in big truck towing and recovery techniques and will tow your truck to your desired destination. Call our 24hr Heavy Duty Towing service at 678-933-1672. Our extensive and flexible fleet of heavy duty tow trucks are able to provide all sorts of truck towing services, both emergency and scheduled. Our reputation is known for providing quick, friendly, efficient and cost effective truck towing services for our clients and has allowed us to become the premier provider of truck towing services in Metro Douglasville area and beyond. We’re on call 24 hours a day, seven days a week. If you need help on Douglasville or the surrounding areas of Ga, call us at 678-933-1672 anytime.